Will we hit the €10,000 mark…..There was no Match 4 winner of the Club Lotto on Friday, 26th September when the numbers drawn were 3, 9 12 and 22 so next week, the jackpot goes up to €9,800. If you’re not already signed up please do so as not only are you in with a chance to win a serious Jackpot but you are also helping support your local club. It is €2 per week but goes a long way towards running all the facilities that we have. Lorcan Curran was the name drawn in the Lucky Dip. Further details are available at www.brayemmets.com. This is the big one this week as we take on the Glenealy who are going for five in a row on Sunday in Aughrim at 3.30pm. We need to have every club member there to get behind the team as we all know from playing how important a role the supporters play. And if been in one final wasn’t enough of a reason to be there well we are also in the Junior Hurling Final which is the curtain raiser for the senior match where we play Carnew at 1.15pm. So it’s all roads to Aughrim and we look forward to seeing everyone there. The under twelve hurling team played Kiltegan on Sunday last in Ballinakill in an under twelve county final. Bray started brightly with Sam and Philip playing well in midfield providing good ball in to a dangerous forward line of Brian, Gavin, Oscar, Peter and Jack. The backline led by Aaron, Tadhg, Sebastian, Zack and Luan kept many dangerous attacks at bay with Cathal very assured in goal. Bray were up by a couple of points at half time but knew that Kiltegan with their proud tradition in hurling would come back in the second half. True to predictions bray were under the cosh for the first ten minutes of the second half with heroic performances by Tadhg, Sebastian, Eoin, Ben and Aaron in the backline, Cathal’s clearances took the pressure off the backline now working overtime. Sam and Philip were trying their best in a crowded midfield with the forward line of Brian, Conor, Jack Daniel and Daniel Munro always looking dangerous. Kiltegan to their credit kept going and were rewarded with two well taken goals to go ahead. A bullet of a goal by Sam towards the end had the result in doubt up to the final whistle but Kiltegan got the last score to win by two points to be victors on the day. Well done to Kiltegan to winning and especially the great second half fight back. Thanks to the Wicklow Coiste na nOg for arranging the finals and to Colm Gaskin who refereed the game in a fair manner. While a loss was our fate on the day the lads should be really proud of their performance not only in the final but throughout the season everyone got plenty of game time which is the most important thing on the day. There has been a huge improvement by this group and no doubt it will continue in 2015. The coaches would urge all the players to continue playing and practice, practice, practice over the winter so that the team will be suitably ready for the challenges next day year. Team: Cathal, Tadhg, Aaron, Zack, Sebastian, Luan, Sam, Philip, Jack, Brian, Peter, Gavin, Oscar, Daniel F, Daniel M, Ben, Eoin, Conor. The boys U9 hurling team participated in the U9 hurling blitz in Bohernabreena on Saturday morning 27th Sept 2014 where they played 3 games against the hosts St Anne’s, St Marks and Stars of Erin. All 11 players performed excellently and demonstrated great skill, commitment and teamwork. Panel: Kyle Plunkett, Cathal Ryan, Finn Redmond, Cillian Ryder, Rafe O Midheach, Harry Pierce, Conor Broderick, Sean Kenny, Fionn Laffan Moran, James Healy, Ciaran Kelly. 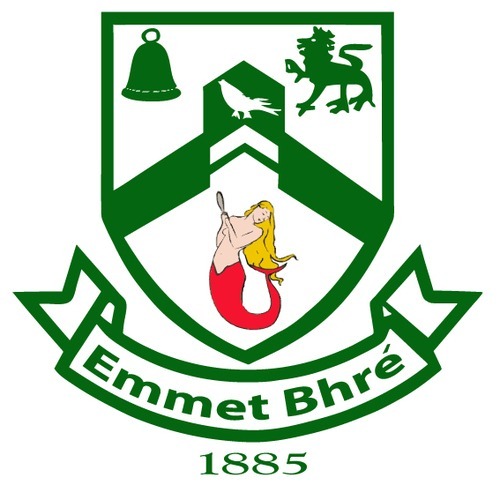 Bainisteoir – Muiris O’ Ceallaigh. All in Bray Emmets GAA Club would like to express are deepest sympathies following the tragic death of Déaglán Ó Maolmhuaidh (Declan Molloy) on Monday evening. Declan was a club man true and true who was involved with many teams at both club and county level over the past number of years. He gave willingly of his time to the club and was an extremely popular club member.